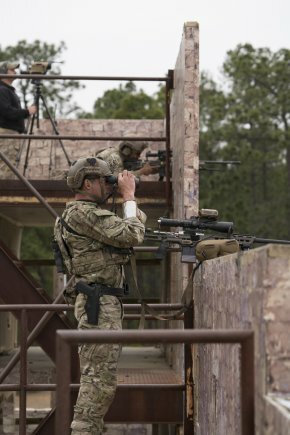 The 1st Special Forces Group (Airborne) sniper team won the ninth annual event, which was held on Fort Bragg, North Carolina, March 18 – 22, 2018. Comer, Ga. (April 2018) –MasterPiece Arms (MPA), manufacturers of the MPA BA Rifles and Chassis Systems, is pleased to announce that the 1st Special Forces Group (Airborne) sniper team, who earned overall first place honors at the ninth annual United States Army Special Operations Command International Sniper Competition, were using rifles built upon MPA chassis’ during the competition. The International Sniper Competition took place on Fort Bragg, North Carolina, March 18 – 22, 2018 and was comprised of 22 events of challenging and combat oriented precision fire competition. The winning team was comprised of two Green Beret’s with the 1st SFG (A). “Our chassis are precision and quality-built instruments designed by dedicated craftsmen. We’ve seen the results our rifles and chassis can produce during Precision Rifle Series competitions and are honored to see some of the most elite and world-class teams in the world not only using them, but taking top honors, at the USASOC International Sniper Competition. We congratulate the 1st Special Forces Group (Airborne) sniper team on their impressive win and thank them for their service and dedication to our country,” commented Phil Cashin, Owner of MasterPiece Arms. The 1st Special Forces Group (Airborne) sniper team competed alongside 22 other special operations forces teams from around the United States military’s most elite units and international special forces teams. The competition was hosted by the U.S. Army John F. Kennedy Special Warfare Center and School and the 1st Special Warfare Training Group (Airborne). This entry was posted in competitions and tagged MasterPiece, sniper, SOF, SOF International Sniper Competition, U.S. Army. Bookmark the permalink.